In our program, 'Edible School Gardens', which has been successfully introduced into over 20 schools on the Sunshine Coast, we follow the principles of Permaculture. In 12 months you can work with all seasons, record all the information about planting, caring for plants, harvesting, seed saving, propagating, composting, worm farms and green manure crops, keep a journal and create reference folders so the information is all there for the teachers, parents, grandparents and students to empower them with knowledge and confidence so that they too will become part of the program and use the garden as a living classroom. Students learn the life skill of growing organic food and the systems within them. 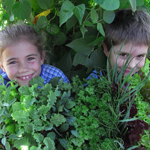 The Edible school gardens program is a kid driven program! experience the different methods of cooking food from the garden. More.. Developing edible gardens within school communities has encouraged healthy eating habits amongst thousands of children, parents and teachers.